There is some confusion over the Birth of Kado. What is known, is that he was born to a pair of Jashinists, Jonin of Kirigakure, and respected due to their skills... their odd little rituals to their God's not really effecting the Ninja of the village, as most were quite bloodthirsty, and saw their worshipping as simply turning their Slaughtering into a Religion. Even if it was a little odd to some. On the day of his birth, they began to Enact a ritual, to give him the blessings of Jashin, Empowering him to become a True Priest, an Avatar of their God. Not much is known about the ritual itself, the components needed to create it, the sacrifices that were given... All that is known, is that the day after, Only Kado was left alive inside their Temple. From there, He was found a few days later by some of his parents friends, and Raised in their household... a Bloodthirsty one of its own sort. Raising him alongside their own children, they taught him how to read, how to write... and gave him texts from the Temple, as they knew his parents would want him to continue their faith. The texts were informative of the Rituals he should use, learning a very Useful technique for hurting enemies... his bloodlust Awoke at those thoughts, and he remembered... There was an Academy. For Ninja's... they fought strong opponents, didn't they? 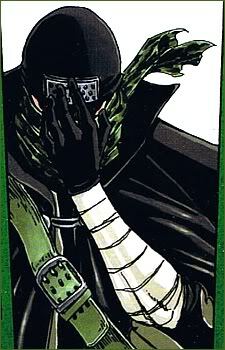 Strong Opponents, plus missions that would give him Sacrifices for Jashin. With those two thoughts in mind, He started at the academy, even if he was a little older then most at this stage. Ferverently studying the technique, to finish them, and become a genin, he took in as many techniques that they were taught as he could, learning some basic Chakra manipulation abilities as well... and using those, to create some technique of his own. His First technique was the Puppetry technique, as, During one of his more... Vicious fights, he had been Beheaded, with his body no longer responding to him... and odd experience, and one he didn't wish to repeat. He had learned at that time, that he was... Different. Shocking his opponent due to the whole, Head swearing at him. He managed to get a medic nin to reattach his head to his body, and stumbled off to consult his texts. Finding a reference to himself wasn't too hard... And that was when he discovered, he was the Avatar of Jashin. As such, he decided to keep his texts on him at all times, reading through them when he had a break in time... and that he needed a weapon. He did have money, leftover from his parents, and given to him when he first started in the academy to help buy his textbooks, among other things. He had most of it left, and had already bought all his books... so he journeyed down to the Weaponry shops, looking for something that would suit him. He found it, eventually... or Them, anyway. Two Massive blades, each made of Six blades. It took a little convincing to get the Smith to sell them to him, even though he was only an Academy student, but he managed, eventually. From there, he began carrying the blades around with him... though it did cause a drop in challenges, unfortunately. Using the Chakra manipulation abilities, he did manage to create some techniques with the blades, badgering the Ninja that had taken him in to help a little with them... With their help, he created two more techniques, his 'Reclaim, Reformation!' technique was one, the other... didn't really need their help too much, though he did check with them to see if there was anything to add to it, and was advised to 'Wait until he had learned his Affinity' as that would help... whatever that meant. Has Achieved an insanely high level of dexterity in his hands, while having its benefits in increasing hand-seal speed, is mostly used for Complex Kenjutsu moves. High level Chakra Capacity/Reserves- Constant training for his chakra has resulted in him having one of the Highest chakra reserves of the Genin. Swordsmanship- Though he wasn't trained by anyone, he has proven to be quite inventive in his techniques, blending in several different styles he had seen, to try and create his own unique way of fighting. Is the Creator of the Jujutsu (Sorcery) Techniques, and is currently working on Creating an actual Technique tree of them, instead of a Single technique. Position: Destruction Specialist, of the Genin Variety. 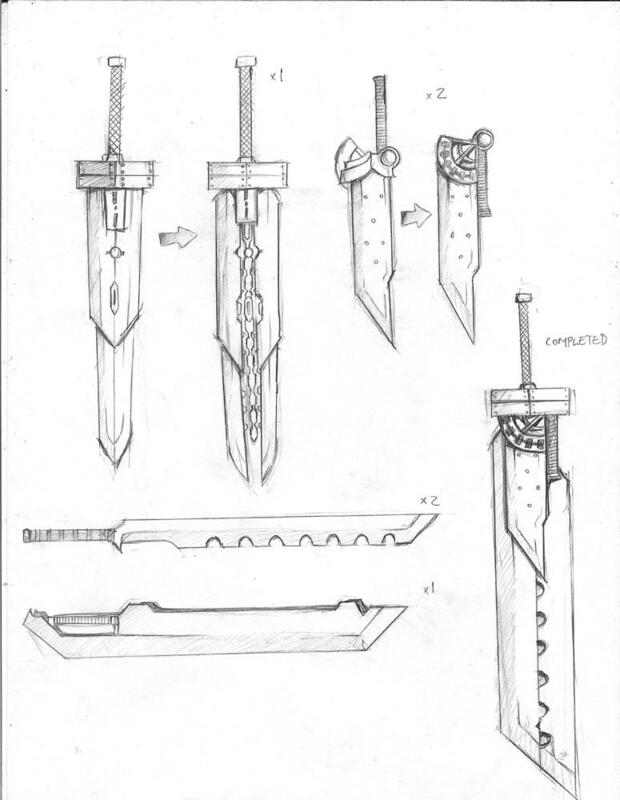 While rather Unique in appearance, and the fact that His sword can actually split into six if taken apart, the sword itself has of yet, No unusual abilities of its own, apart from being seriously hard to break. Kado actually has Two of these massive swords, strapped to his back. This makes for a rather intimidating sight, quite helpful if he is needed to help Intimdate enemies. The only additions to the Original form, are that he's attached the symbol of Jashin to the end of it, via a band. He also wears a second one on a chain around his neck. Academy Three are automatic, Bunshin no Jutsu, Kawarimi no Jutsu, Henge no Jutsu, and the techniques learned during classes as well. Simply put, this is a Return technique, summoning the throw swords from earlier techniques back into their positions on the original two Tsurugi's. Rather handy when an opponent thinks they can use his weapon against him, it also summons the two large blades to his hands at the same time, which can be useful for a quick draw. Due to the Ritual that empowered him, linking him to Jashin, God of Destruction, Kado gained a Unique form of Immortality. It is unknown if he has actually stopped aging, but it is known that He cannot die from wounds. Sliced apart, divided and Quartered... he will continue to live, Not even Blood Loss will kill him. Of course, he will usually pissed by this, yelling and screaming... which is kinda creepy, seeing just a head yelling at you. At one point, Loss of a head would stop this Lunatic... but he solved this problem by researching ways to keep his body connection... which resulted in him creating the Puppet Technique, Kugutsu no jutsu. The ritual also Attuned him to what he calls Religious or Spiritual Chakra. It is what he uses for his techniques, and as of yet, None have been able to copy them... This might be because of the energy involved... or the fact that most of these Techniques involve the dismemberment of the user though. This technique is Kado's primary method of killing his opponents in a way of the Jashin religion. First, Kado makes every effort to draw blood from his opponent and consume it. After that, his skin turns black with white markings representing a skeleton, a symbol of absolute death. He then draws Jashin's symbol on the ground in blood and stands in the center. This serves as the link between him and his victim. Once his sacrificial ritual takes place, the victim is linked with Kado until he either steps or is forced out of the circle. Any kind of injury that Kado inflicts upon himself (or the injury they inflicted on him) is inflicted upon his target, be it a mere scratch to a pierce in the heart. If Kado is forced to step out of the circle, the link is broken and the victim is set free, but all Hidan has to do is to step back into the circle to reactivate the link. Basically, this technique makes Kado a living voodoo doll. Apologies about doing this, but it's another profile I've seen that was not correctly looked over by other staff before being accepted. You need to fix a few things. 1) No puppetry technique. Not only is it on the unavailable list, but you would not be able to utilize chakra strings (or any techniques) if your head is severed from your body, so it would not be of any use anyway. 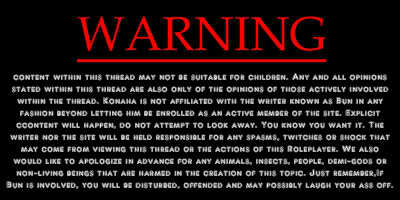 2) I was going to also mention you have too many jutsu. The limit is three, and as it currently stands, you have more than that. Also - The fact that you have immortality as a bloodline is fine, but also possessing the ritual technique as a Genin is FAR too powerful to be balanced in any way. I will add it to the forbidden list so you can be the one to obtain it later on, as I'm totally fine with the technique itself, but as a Genin, that would put you FAR above anyone else in terms of potential power. If you disagree with any of this, just let me know and I will fairly discuss with the other staff members and get back to you.